Set in the lush bayou of Louisiana, Kimberley Griffiths Little brings Livie's story to life with power and grace. I love how much the cover screams Louisiana Bayou. It's so peaceful looking too. Livie is just so sweet. I want to hug her! To say that The Healing Spell touched me is an understatement, but I can't quite find the words to accurately describe how much I truly adored this book. Filled with lessons, angst-driven at times and completely uplifting at others, it is one of those books that truly made a mark on my life as a reader. From the moment I started the book I fell in love with Livie and her sisters. In fact, this book had the power to transport me back to the days when I too felt like Livie did. Lost, lonely at times, and yet still always loved. My love for Livie started when, as I mentioned above, she reminded me of that tough time between being a child and becoming a teen. At 11 years old, Livie isn't sure where she fits in the world around her. She doesn't quite get the "girlie" things that her sisters do, but she isn't quite comfortable being described as a tomboy either. Watching her navigate this difficult time in her life was so deeply touching. As I watched her make decisions, some good and others bad, I fell more in love with her character. Livie is one of those flawed, realistic characters that I adore. You see the cracks, but you love her all the more for them. As for the story itself, it is pure magic. I think I cried more during this book than any other that I've read, as I contemplated how I came to be the person that I am now. We've all been through what Livie is going through, even if it wasn't the exact same. The sheer honesty between these pages is what really drew me in. Unfortunately, there isn't too much I can say without giving the plot away, so instead I'll gush over the setting! It is so apparent that Kimberly Griffiths Little researched the bayou that she set Livie and her family in. The lush setting jumps off the page at the reader, and I am sure I learned more about Louisiana bayous than I ever knew before. Besides being the perfect backdrop for Livie's story of hope and growth, it is also a fascinating entity in its own right. You can probably tell from my gushing, albeit rambling, review that I really fell in love with this book. I'll be sad to part with my copy when I give it away tomorrow, but I'm looking forward to purchasing one of my own! 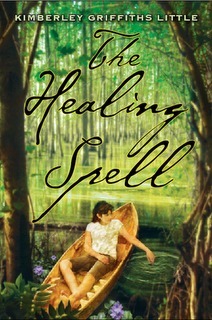 The Healing Spell will definitely be one of those books that I'll read again. I'm looking forward to it. Source: Received through promotional tour for review.